Prayer is too often overlooked as a meaningful way to engage the world around us. It’s partially due to our rational and scientific orientations that began with our study of the scientific method. It’s also partially due to our observations that prayer is sometimes less effective than we thought it would be. Many remedies for our disappointments about prayer have been offered. Some say that our prayers are answered in ways that we don’t always recognize; or, that we “walk sightless among miracles.” But, there’s another remedy. In Judaism, the role of prayer is highlighted in the root of the word “to pray” in Hebrew. “L’hitpaleil” to pray, is the infinitive form of the reflexive verb. That is, to pray means that we’re essentially seeking prayer to make a change within us, not outside of us. Here’s a prayer that was written by Rabbi Samuel E. Karff, Rabbi Emeritus of Congregation Beth Israel in Houston. He wrote it for the children of Congregation Beth Israel’s Shlenker Day School. Help me to know that I am loved. Help me to think of others. Give me courage to keep trying. Help me to see that I have important reasons to be thankful. Help me to know that You are with me. 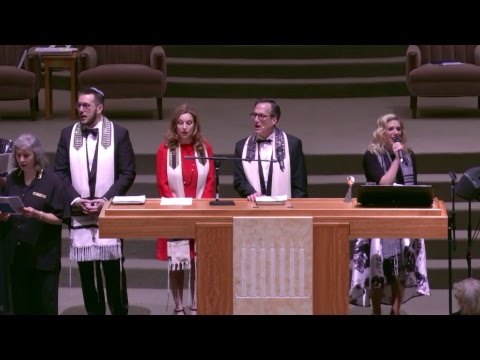 In this prayer, Rabbi Karff identifies very personal needs we all have from time to time, and for which we all seek help; and, then, he places us in covenant with God to find the results we seek. Where do we find the results? It’s within us, where God already placed skills, abilities and gifts to accomplish what we need. The prayer doesn’t say, “When I have lost or failed, give me success.” Instead, it relies on our hope that God will help us find in a particular trial or event what is required of us. Our ability to grow and become the persons we’re intended to be depends on it. Though the prayer was written for children, it’s clearly a prayer for adults, too. It’s just that children, who often seek God in their prayers, are just beginning to learn that the answers to their prayers are already inside of them. As they grow, they’ll hopefully learn to trust God’s gifts to them. Couldn’t the same thing be said of us at our age? For all these and more, we offer thanks. What is your prayer this week? What can you find within yourself that will make a difference where you need it most?